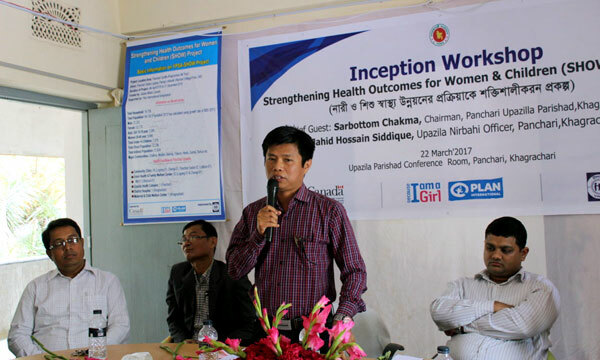 YPSA organized Inception meeting of ‘Strengthening Health Outcomes for Women and Children (SHOW) Project’ in Panchari Upazila of Khagrachari district on March 22, 2017 at upazila parishad conference hall. This project is funded by Global Affairs, Canada with the technical support of Plan International, Bangladesh. Mr. Sarbottam Chakma, Panchari Upazila Parishad Chairman was the chief guest of the inception meeting while Mr. Jahid Haossan Siddiq, Upazila Nibahai Officer of Panchari presided the meeting. Chief guest of the meeting said, we should work jointly to reduce the death rate of women and children to zero. Public awareness should be created for improvement of the existing health facilities in all over Bangladesh specially Chittagong Hill Tract. If community is aware of health services, all sectors will be improved. Government and Non-Government stakeholders should be progressive for ensuring sound health services to all people. Md. Jashim Uddin, Project Manager of YPSA-SHOW project delivered his welcome speech in the meeting. The brief activities of the project presented by Md. Habibur Rahman, Technical Officer of SHOW project. In the key note presentation, it was highlighted that this project is implementing 5 unions of the Panchari upazila and working for ensuring regular health services to pregnant, adolescent girls, young women, new born baby and below 5 years aged children. In the inception meeting, Dr. Imranul Haque, Upazila heath and family planning Officer; Sohagmay Chakma, Upazila family planning officer; Jaynath Deb, Upazila General Secretary of Awami League; Md. Nazir Hossan, Chairman of Panchari Sadar Union Parishad; Pratuttar Chakma, Chairman of Logang Union Parishad Chairman; Kalachand Chakma, Chairman of Chengi Union Parishad; Kiran Tripura, Chairman of Latiban Union Pairhshad; Bijoy Chakma of Ultachari Union Parishad; journalist natun Dhan Chakma and formal UP member Rozi Akhter delivered their speech during the open discussion about the theme of SHOW project activities. Abdul Halim and Nipa Talukder, Field Coordinator of YPSA SHOW project facilitated the inception meeting.